Wonderful swashbuckling adventure that delivers everything you could possibly want from a pirate movie, plus a little more besides – jaw-dropping special effects, a superb script and a show-stealing performance from Johnny Depp. It’s fair to say that, when Pirates of the Caribbean was announced, nobody was all that excited about it. For one thing, it was ‘based on the popular Disneyland ride’. 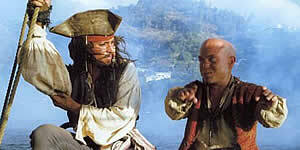 For another, pirate movies were notorious for sinking without trace – Cutthroat Island, anyone? So it’s something of a surprise then that Pirates of the Caribbean has surpassed all expectations and turned out to be a fantastically enjoyable action-adventure film – already a huge hit in the States, it’s on course to be the best blockbuster of the summer. Produced by Jerry Bruckheimer and directed by Gore Verbinski (Mouse Hunt, The Ring), Pirates of the Caribbean stars Johnny Depp as Captain Jack Sparrow. Left for dead after a mutiny by the villainous Captain Barbossa (Geoffrey Rush), Sparrow arrives in the town of Port Royal intending to give chase to his ship, The Black Pearl. Unfortunately, the officious Commodore Norrington (Jack Davenport) scuppers his plans by having him arrested as a notorious pirate. When Barbossa’s men attack Port Royal and kidnap the Governor’s beautiful daughter Elizabeth Swann, (Keira Knightley from Bend It Like Beckham), Sparrow joins forces with Elizabeth’s childhood friend, swordsmith Will Turner (Orlando Bloom) and they set off to rescue her, pursued by the Navy. However, they get their timbers shivered when they discover The Curse of the Black Pearl – an enchanted treasure has condemned Barbossa and his men to live for eternity as the undead, meaning that they are, in fact, Zombie Pirates. Pirates of the Caribbean basically delivers everything you could possibly want from a pirate movie: swordfights, romance, plank-walking, rope-swinging, cannons, treasure, parrots, Zombie Pirates, you name it, it's here. Bizarrely, it’s also astonishingly ‘faithful’ to the theme-park ride, with each memorable ‘scene’ seamlessly incorporated into the film and several knowing gags thrown in. The acting is excellent. Bloom makes a splendid swashbuckling hero and Knightley is the perfect heroine - achingly beautiful, feisty and funny, it's only a shame she doesn't get to do any swordfighting (although there's a good scene where she almost does). Rush makes a good, hissable villain without going too wildly over the top and Davenport’s character is a refreshing change from the usual pantomime sneering British villain you’d expect (think Tim Roth). It really is Depp's film, though. In interviews he has gleefully admitted to basing his entire performance on Rolling Stones guitarist Keith Richards. Caked in mascara and seemingly in a permanent daze, he moves through the film with a weird, almost feminine grace, delivering his lines with casual perfection. It's a brave performance because it could so easily have gone horribly wrong – instead, it’s hilarious and you won’t have seen anything like it. Practically every moment Depp is onscreen, then, is a pure, unalloyed joy. He's aided by a terrific script that encompasses a decent plot and some wonderful, laugh-out-loud lines, without ever sailing into postmodern nods-to-the-camera territory. The effects work is superlative and puts Harryhausen's skeletons to shame. The set pieces are incredible, too - the fight between the two ships is stunning (and has some priceless visual gags) but the key, show-stopping, unforgettable moment is the Attack Of The Zombie Pirates. If there’s one tiny flaw, it’s only that the swordfights are neither as frequent nor as good as they could have been - they're good, and they're not edited beyond recognition, but they're not GREAT, possibly because Zombie Pirates can't be killed so none of the fights really “count”. That said, for pure swashbuckling blockbuster entertainment, Pirates of the Caribbean is the most fun you’ll have all summer. You’re guaranteed to emerge, grinning, into the sunlight, doing pirate impressions all the way home. Highly recommended. Arrr.